As an associate at MacDonald Weiss, Della works on a wide variety of corporate, M&A, commercial, tax, software licensing, and other general business matters for both US and non-US entities. Certified by the International Association of Privacy Professionals (CIPP/US), Della focuses a segment of her practice advising clients on privacy, data, and other consumer protection obligations under US state and federal law. Della is a graduate of the University of Virginia School of Law, where she was an editor of the Virginia Journal of Social Policy and the Law. Before joining MacDonald Weiss, Della served as the judicial law clerk to the Presiding Judge of the Court of Criminal Appeals, the highest criminal court in the State of Texas. 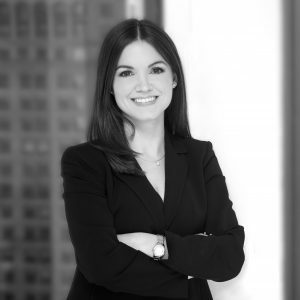 During her law school years, she worked as a summer intern with Foley & Lardner in Washington DC and as a summer associate with Rucci, Burnham, Carta & Carello in Connecticut. Della received her B.A. degree from the College of William and Mary. She spent a summer term studying in Bath, England, as well as a semester in Paris, France where she earned a Certificat de Langue et Civilisation Françaises (Niveau Superieur) from the Cours de Civilisation Française de la Sorbonne. After graduating from the College of William and Mary, Della worked as a language assistant near Bordeaux, France, a position she obtained through the Ministère de l’Éducation Nationale. She then spent two years as a paralegal for Bromberg, Kohler Maya & Maschler, a Washington DC law firm with an international client base. Elle parle français.